Don't miss this entertaining look at a defunct football league. “Football for a Buck” received plenty of attention shortly after its publication for a somewhat strange reason as these things go. The President of the United States plays a relatively good-sized role in its story. Donald Trump doesn’t exactly come out as the hero of it either. The book is about a football league that lasted three years and went out of business with something of a whimper. It was a labor of love for author Jeff Pearlman, who had no idea when he was planning this book that Trump would become an occupant of the Oval Office. So it’s a happy coincidence that Trump finally did something good in the world of sports. Because “Football for a Buck” is fabulous and fun for more than 300 pages. Author Jeff Pearlman has written a variety of good books over the years, and never steered away from controversy in the process. This effort, though, is a little different. 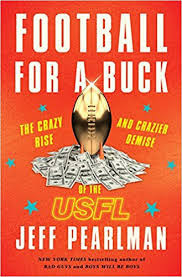 Pearlman admits that he had something of a crush on the United States Football League when it was formed in 1983 – when the author was in school – and he obviously had a ball doing the research (something like 400 interviews) and writing for it. For those who are too young to remember, here’s a refresher course on the USFL. The idea was to form a nice little football league in the spring – when there would be no pressure to compete with the NFL, and give the nation’s football fans something to watch. Remember, the NCAA basketball tournament was just starting to grow in the early 1980s, and the same could be said for basketball and hockey playoffs. In other words, it was easy to picture a niche for the new league. It’s a rather typical story for the a new sports league. Some teams were well financed and professionally run, and did fine. Others had poor ownership and very limited talent. It set up something of the haves and have-nots when it came to on-field play. Sometimes the teams folded up their tents and moved quietly to the next city. While there was a plan to keep budgets in place in order to slowly build a winner, rich owners quickly decided to violate that rule when they had a chance to win. For example, the Michigan Panthers signed some expensive offensive lineman in the league’s first season, and the move produced a champion. It’s the stories that make the book come alive, and Pearlman collected bunches of them. There are tales of fights and drug use. A tale about two busloads of prostitutes greeting a football team that had just moved to a town, handing out business cards to their new potential clients. Stories about missed payrolls and players who invented new reactions to being cut from a pro team – like punching the coach. Since the league was in business more than 30 years ago, everyone seems free to open up about everything that went on. It’s all great reading, and frequently hilarious. Trump certainly gets plenty of attention in this story, and it’s fair to say that many blame him for the demise of the league. Trump spent wildly and foolishly on his New Jersey Generals, couldn’t control his ego, frequently lied, and alienated himself from practically everyone – according to the accounts here. Anyone going to his New York City office for an appointment – anyone – had to sit through an eight-minute video explaining how wonderful Trump was. I particularly liked the story about how Trump disguised his voice slightly and called reporters as “a public relations man” to leak stories out. This sort of behavior may sound familiar if you’ve been reading newspapers in the past couple of years. More than that, Trump urged the league to move to the fall and compete with the NFL head on, probably in the hopes of getting into the established league one way or another. He also assured his fellow owners that the USFL would win an anti-trust suit against the NFL that would change everything. The new league did win the suit, but was only awarded $1 in damages – times three, because it was an anti-trust case. The USFL was instantly dead, and legal analysis indicated that Trump’s own testimony was a major reason why the upstarts did not win the case. The USFL may not have survived past three years, but its influence was felt for quite a while. Players like Jim Kelly and Reggie White became Hall of Famers, while executives such as Carl Peterson and Bill Polian became major players in NFL executive circles. It also helped push the NFL toward such rule changes as replay challenges and the two-point conversion. Admittedly, I’m a sucker for books on new leagues – I’ve tried to read them all. “Football for a Buck” is right up there with “Loose Balls” (an oral history of the American Basketball Association) for entertainment value. Don’t miss this one.